It's May of 1940, Steph Farrow (Clare Calbraith) is target shooting and Claire Hillman (Daisy Badger) is making a stand: she won't pretend she's not with Spencer Wilson (Mike Noble), she'll do his shopping and be seen holding his hand in public and everything! That's all very well and good until she gets to the shop of Miriam (Claire Price) and Brynn Brindsley (Daniel Ryan), who've sent their only son grudgingly off to war. Miriam refuses to fill the ration requests for the Wilsons, so Brynn steps in to do so. I used to give Miriam perhaps short shrift on here for being so unable to function sans her kiddo: now I get it. I GET IT. 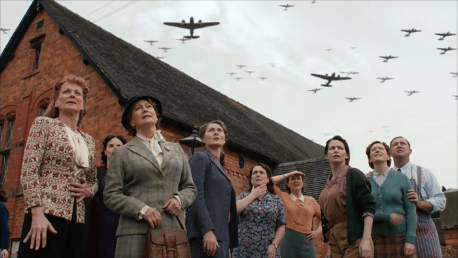 Frances Bardem (Samantha Bond) breaks the bad news to the Women's Institute, the war isn't going well and not likely to smarten up any time soon. Sarah (Ruth Gemmell) introduces the new federal fundraising plan to buy ambulances; Frances sets the WI goal at 50 pounds. Everyone hollers; that must be a lot of money for 1940. Frances pooh poohs their reluctance; Pat alone could raise half that with her cakes! But nobody has seen Pat Simms (Claire Rushbrook - SO MANY CLAIRES) lately, Erica Campbell (Frances Grey) knows what's up but nobody else does. Erica may have mentioned that it wasn't just her who thought Pat was being beaten by her lanky shite of a husband, but she didn't give names, so Pat has no idea who's been talking about her "situation." The ladies chat in small groups after as Pat dodges friendlies on the street, Frances figures Steph can teach them all to shoot rabbits for pies for selling! Frances wants to find out what's shaking with Pat but Sarah's worrying about meddling. Her dishy hubs, the Reverend Collingborne (Mark Bonnar), has warned against that type of thing. Frances invokes the Vicar halo... men of the cloth aren't always right, everyone just thinks they are. Joyce Cameron (Francesca Annis) walks down the road a little less stridently than usual; she seems somewhat diminished by the revelation of her vulnerability. Or that she feels diminished, whether she is or not. Jenny (Jodie Hamblet) hustles over to share confidences about her fear of enclosed spaces; Joyce doesn't know what she's talking about, thankyouverymuch. It's awful to think you aren't allowed weaknesses or to not be perfect. Isobel the Blind (Gillian Dean) will be spending a few days on the farm, when Frances drops her off she asks Steph again about a rabbit-shooting lesson. Because if things go from bad to worse, that's a good skill to have. Let's start at the beginning: with tea. The Brits are so sensible. Laura Campbell (Leigh Mimmack) and her sister Kate (Rachel Hurd-Wood) watch their father Dr. Will Campbell (Ed Stoppard) carefully; does he have tuberculousis? No, no. They almost sigh with relief, then out he comes with it. He has cancer. Lung cancer and it's not good. Erica comes in and it's family cuddle time with lots of grownup tears. Oh no no no, Alison Scotlock (Fennell Woolgar) can't live with cooking the books for a bunch of "traitors" (perhaps a bit harsh, but not to her) looking to war profiteer and she can't see a way out of it either so she's left a note for Teresa Fenchurch (Leanne Best) and the gas on. Boris!! Leave the dog out of it, Alison! Extremely inefficient (the whole house, Alison?) but awful all the same: surely there's something else that can be done! Teresa, GET HOME! He needs her able to work, see. And apparently she's a child. Teresa gets home in time to find Alison almost dead (Boris is fine!) and saves her life. I once saved a man's life who was trying to commit suicide: he was SO MAD. Frances, Sarah and Steph are out shooting guns, sister Sarah oversteps and questions whether Frances is trying to prove something with her husband Peter gone. Just as I was thinking that wasn't the best way to go about bringing some home truths, since Sarah has no room to talk and Frances HAS A LOADED GUN. Teresa thinks Alison was being far too hard on herself about taking that jerk's money; she was a desperate woman backed into a corner. She'd like to help Alison, as a friend, as an equal. Poor Alison is so used to being alone, locked up with her secrets and self-loathing and she doesn't really know what to do. I hope she takes the help. Also looking for help is Frances; approaching Joyce about rejoining the WI to help with the fundraising for ambulances. I guess Hell hath officially frozen over! Joyce isn't interested in some kind of bizarre democracy as the WI is now, people talking as equals! WHUT? AND people talking to her on the street like they're HER equals! The world has clearly gone mad and Joyce wants no part of it. Her husband has decided that they'll spend the rest of the war at the coast, so there! I mean this in the best way; if this target has you kneeling to kiss the ring of Joyce Bleeding Cameron, perhaps you had better look at why this is so important to you, Frances. Miriam got a telegraph with an apology; she's not opening that. She hides it behind teacups. Erica has an unexpected visitor; it's Charlotte Bowers (Elisabeth Hopper) and she'd like Erica to tell her daughter to stop sleeping with her husband, please! She ushers her inside anyway so nobody else hears; there is no way that's possible! But Charlotte literally has the receipts; from the hotel where her husband Richard (Philip McGinley who has a fantastic IMDb photo, so much more interesting than onscreen) has been "unwrapping" Laura like a sweet as he does all his young girls. Charlotte drives the knife in that bit deeper as she leaves; this was uncalled for, Charlotte. Oh yay!!! Bob got the job, he's going to The Front to write about the job! Maybe he'll get hit with friendly fire if the Germans don't get him! All together now, let's form a non-denominational prayer circle to oooohhhmmm that this comes true. Sarah's explaining the Women's Institute's plan for fundraising to dishy Nick Lucas (Mark Umbers who is so good looking that I have to wonder if he ever gets to hold a full conversation with all the drool wiping), who rains allllll over her parade: 4 or 5 ambulances won't do anything in case of an air raid: they will need at least a thousand. You know, Nick: they're trying. And maybe that ambulance could be carrying your adorable bum to safety, how about that? He apologizes, but she's already upset. Oh but he hasn't opened it, he wants them to read the words together. But David is just missing! He's not been found! I was all ready for a good cry but Miriam and I are very excited about this missing business! Erica's been waiting for Laura, who got a ride home from her boss, Richards Bowers. Time for a talk. Laura doesn't deny what's happening with Richard, but it's when Laura compares her feelings for what Kate and Jack had, Erica snaps and slaps Laura. How dare she compare the two? To be honest, I've always thought they were very similar: both girls rushing headlong into adult situations much faster than normal because of the impending war. Remember back in the beginning when the sisters were riding their bikes around like overgrown children trying to get a peek at the men in uniform? They grew up very quickly and their relationships aren't THAT different. Just that Richard is just innit for the unwrapping instead of church-sanctioned wobblie-smushing. Also: Laura and Richard have been able to spend time together, even if Richard's lying the whole time. So why does Charlotte Bowers stay? Why does Richard if he's so clearly not happy at home? Erica wrings out a promise from Laura to break things off, otherwise she'll tell Laura's dying father what shenanigans his daughter has been up to. Jaysus. Dishy Nick is being redeployed elsewhere, oh and Sarah is going to miss him. Somehow he leans in for a kiss, which she stops. She might feel that way, but she can't. I have to wonder if they'll ever see each other again. Frances has sent for Pat as they've all heard about Bob's new job (YAY!! Ohm ohm ohm), giving her the best present ever: the knowledge of "who" has been talking about Bob's abuse. It's just Frances, Sarah and Erica, Pat, you can stop hiding ,you poor thing. Frances wraps her in a hug, she's so happy Pat will be safe! And back in the WI, it's not the same without her. All the tears for Pat's being safe. Laura meets with Richard offsite; he appears stunned and is unshaven and disheveled. Charlotte isn't staying after all! She's filed for divorce AND named Laura as co-respondent. Yikes. Remember Miriam being so tired all the time and Dr. Campbell ran some tests? She's pregnant! Mazel tov, Brindlseys! The movie and bake sale fundraiser is going great guns until Spencer walks in. He takes the moment to make a speech: he and his family have lived in Lower Paxford their whole lives! His dad is on the War Memorial! Being a Conscientious Objector is the hardest decision he ever made and he'd like them to respect it. Miriam does NOT, but Brynn does, so that's something. Laura thinks it was Little Stan who ratted she and Richard out, she won't forget this! During the film, Teresa dumps all of Alison's ill-gotten gains into the box as Alison watches, looks like they'll get their ambulance goal after all. Alison is visibly relieved. Alison and Teresa aren't at the WI meeting as they count the money: 74 pounds! A knock at the door sends Alison to the slay the beast herself, but it's a detective and he's here to arrest her for fraudulent bookkeeping. Joyce is in to say goodbye to Frances and the WI. Look, Frances's bully is leaving too! Frances says "what doesn't kill you makes you stronger;" she just compared you to botulism, Joyce! That's about right...their farewell is interrupted by the rattling of cups and everyone rushes outside to see what's happening. War. War is happening and it's come to Lower Paxford. We're done for season one, the second and final season starting soon. Thanks for reading!